As you all know, I am a huge advocate of a comfortable flat. With all the walking I do in the city, I often turn to the practical choice when it comes to shoes. However that absolutely does not mean that you have to sacrifice style! With that being said, I am absolutely obsessed with these cute little leather ballet flats from ShoeMint. My first though was to pair them with some skinnies for a classic look, but I can't wait to pair them with some tights and sweet mini dresses. Anyway, I am so excited to offer not one, but THREE readers a chance to win a pair of your choice of ShoeMint shoes. Here are the simple rules. 2.) Like Flashes of Style on Facebook. 3.) Leave your contact info in a comment below! Thanks for the giveaway! I love the Emese sandals. 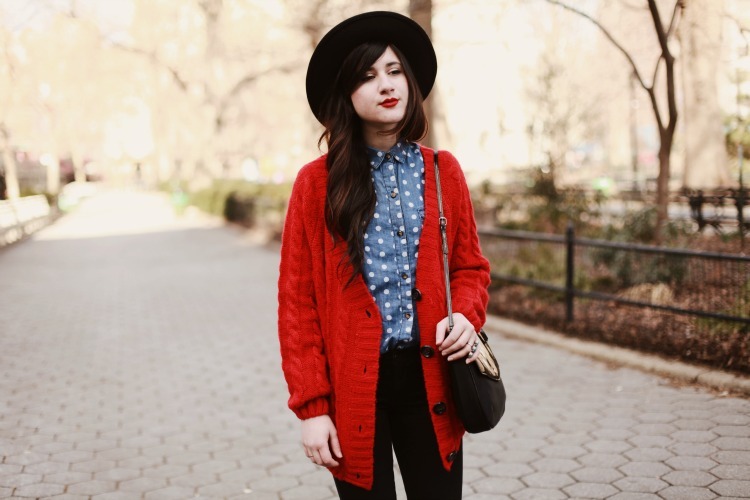 Beautiful cardigan and jeans shirt! That button-up is totally adorable. Love it paired with your red cardigan! Thanks! I signed up and liked you on Facebook. I always make sure I have a good pair of flats in my closet too! also my email is mdstaker@gmail.com love you! I really love that outfit and your whole style and I've been looking for a good website for shoes for months now! I love all the sandals and boots, amating. Liked your page and signed up! Nice photos. My fav is the last one. so lovely, I adore the look of the sweater and the cute button up together! Already said on instagram, but this outfit is perfection. omg love that giveaway! want one of them! already have an account & like you on FB :) great giveaway! Bonnie you look so beautiful! Red looks HOT on you! Awesome giveaway! Momma needs a new pair of shoes! I signed up for Shoemint and I'm already a follower on Facebook. Love a good ballet flat! Love your blog and those shoes! Done and done! You can reach me at ohilarylynn (at) gmail (dot) com! Thanks for such a fab giveaway! I love shoemint, thanks for the giveaway! Done and done, fingers crossed! love this sweater! that recipe yesterday is awesome- I must try! Oh boy, lovely give away! I did both! I love so many of their shoes! Hey dear, you look lovely in that blazer ! So cute ! Love this look! Love shoes! Thanks for the giveaway! Lovely giveaway :-)! And absolutely adore the ShoeMint collection! Adorable!!! I love the combination of blue and red!! Love your style! -One fellow Fayetteville, Arkansan to another! Love your denim top! So cute! 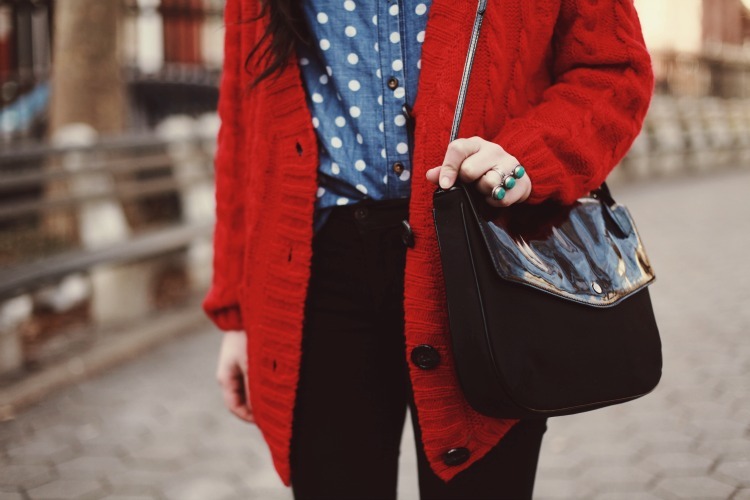 Love the polka dot shirt and red sweater combo! Always wanted to try ShoeMint! I'm so excited about this giveaway! I love the outfit you're wearing in this too! I love all of the Mints! And have had my eye on a new pair of flats. Shoemint has some seriously cute shoes. I have an account with them under whosthisani@yahoo.com and I like you on FB! I did both! I love their shoes I've been eying a pair to round out my wardrobe! i just fell in love with the denim shirt! Done and done. Thanks so much for the giveaway! I've been wanting to try out shoemint for a while now. They have so many cute pairs. Lovely accessories you got here. My wife would love this and knowing it is discounted I could save a lot. I love the polka dot button up! you are so sweet! Thank you for this contest.. Im In! Thanks for this giveaway, love their shoes! Thanks for this opportunity, Bonnie!